Pamela grew up in Namibia and South Africa, studied to be a teacher (Cape Town Training College), travelled extensively in Europe then returned to London to study Fine Art. She achieved a London Certificate of Art and Design (Credit Distinction), Byam Shaw School of Drawing and Painting (St Martin's Central, University of the Arts London). After graduating was an Art Critic for the Cape Times, Pamela taught European Art History at the Ruth Prowse School of Art and worked as an assistant custodian for the South African Association of Arts Gallery in Cape Town. After coming to Canada she has taught children at various school, served on several juries, and has been teaching Drawing and Painting at the Ottawa School of Art since 1986. Exhibits regularly in various group shows and has had individual shows in South Africa, Ottawa and the National Capital Region in Quebec. Pamela Was invited to give demonstrations, a talk and a workshop at the National Gallery and was a NG Studio Tour's Featured Artist. Studio practice includes Drawing and Painting with the figure as dominant factor, integrated into a variety of contexts or themes including a centaur series, collaboration with a pianist to create twelve works for Mussorgsky's "Pictures at an Exhibition", Tango, and currently working on a carousel theme. Works of Winter, oil paintings by Linda Bordage, is the new exhibition at Luna Sole. Ranging from kite skiing on a frozen river to the solitary silence of a snow-laden forest, the paintings reflect the artist’s interpretation of winter. The exhibition continues to March 31. Invitation to Art Place Showcase Night on Feb. 25, 6:30 p.m. to 9:30 p.m. The show mixes the highlights of winter with memories of warmer times. Midwinter colours and textures appear in a series of rural landscapes from Janis Fulton. Cathy Owen brings watercolour images that have that soft brilliance only watercolours can create where the horizons draw the eye. Corinne Feasey presents a wide variety of pieces that cover the complete spectrum of colours. All these artists’ pieces will brighten your winter! Come into the warm and see their visions. L’exposition est un mélange de paysages d’hiver et ceux de la saison plus chaude. Janis Fulton présente des paysages aux couleurs de l’hiver. Cathy Owen ajoute de brillantes aquarelles. Corinne Feasey présente des tableaux aux couleurs variées. Toutes ces pièces artistiques apportent de la lumière en cet hiver. Venez les voir bien au chaud. Join us for Studio Italia 2015 (Oct. 1- 11) "a thought provoking and inspirational" art workshop open to artists of all levels and all media. Ten full days of plein airpainting, art history/theory, touring, discussions and gourmet cuisine/wine in the most beautiful area of Tuscany. Register now! Un rendez-vous Studio Italia 2015, ensembles du 1 au 11 octobre, pour une expérience unique en son genre ! Dix jours de peinture, d’histoire et de théorie de l ‘art, de discussions passionnées et de la bonne cuisine en plein cœur de l’envoutante Toscane! Inscrivez-vous dès maintenant. Arteast Open Studio has been cancelled for this Thursday February 12th. Unfortunately, due to a circumstances beyond our control . Here are the next dates for ‘Arteast open studio’: Thursday, February 26th, Thursday March 12th and March 26th. Please pre-register for the next open studio. We need 6 members per session for the studio to run. The registration form is available on the Arteast website http://www.arteastottawa.com. Veuillez prendre note: Arteast studio libre’ est annulé pour ce Jeudi 12 février, à cause de circonstance imprévue. Par contre, ‘Arteast studio libre’ aura lieu les dates suivantes: Jeudi le 26 février, jeudi le 12 mars et jeudi le 26 mars. Veuillez vous inscrire au moins une semaine avant les dates de ‘studio libre’– un minimum de 6 participant(e)s est requis pour chaque ‘Studio Libre’. Le formulaire d’inscription est ci-joint. Celebrating its 25th year with this latest juried show Arteast invites the public to the opening of “Mosaic”. The reception takes place on Sunday, February 15th 2015, from 1-3 p.m. in the Trinity Gallery on the Ground Floor of the Shenkman Arts Centre, 245 Centrum Blvd. in Orleans. Three Juror’s Choice Awards will be presented. These awards are sponsored by Wallack’s Art Supplies, Avalon Centre, 2012 Tenth Line Road, Unit 2, Orleans On 613 830 2400. Please come celebrate this special Silver Anniversary with us. Célébrant son 25e anniversaire avec une exposition avec jury, Arteast invite le public au vernissage ‘Mosaïque’. La réception aura lieu le dimanche 15 février 2015 de 13 à 15h à la Galerie Trinity , Niveau 1 du Centre des Arts Shenkman, 245 boul. Centrum à Orléans. Trois mentions spéciales seront sélectionnées par le jury. Ces mentions sont commanditées par Wallack’s Art Supplies, Avalon Centre, 2012 Tenth Line Road, Unit 2, Orleans On 613 830 2400. Venez célébrer notre anniversaire d’argent. The Out of the Box Fibre Artists have a display on the main level of the Shenkman Arts Centre, on until March 1st. The display showcases a wonderful sampling of the innovative works created by this group of fibre artists. Anne Warburton, Arteast member, has included some of her art. The display also features some of the works created for an exhibition last fall based on the year 1914. And please be sure to sign our guest book after your visit. From February 11th to March 18th the public is invited to the show “Ripe with Colour”. Oil paintings look at berries “ripe with colour” of various hues as the berries move through their growth cycle. Virginia Dupuis gratefully acknowledges the financial support from the Ontario Arts Council, an agency of the Government of Ontario. Vernissage: February 15th from 1:00 to 3:00 pm. Hours: Monday to Friday From 9 a.m. to 4:30 p.m.
Five speakers, lunch included. Seating is limited. REGISTRATION OPENS JANUARY 9th, seating is limited. $50.00 until Feb 15th, $70.00 after. “ Symposium en Couleurs” has put out a call for art. One of our members, Danielle Caron, is on the organization committee. 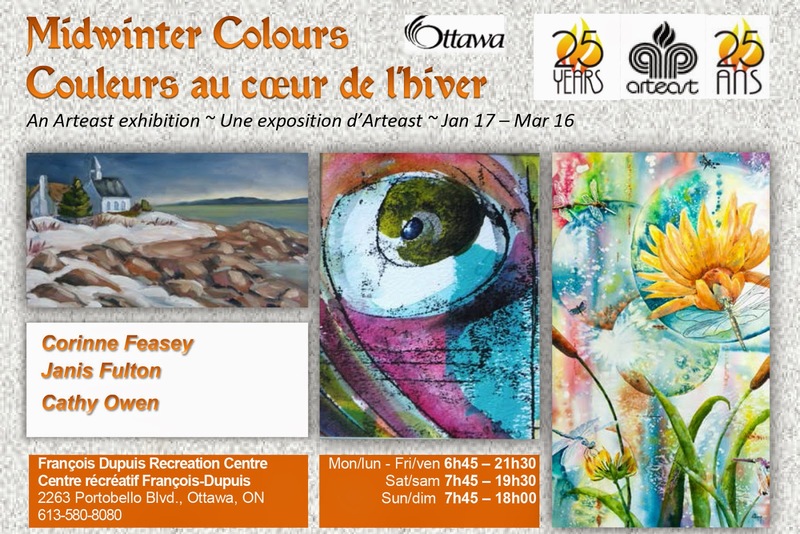 “ Symposium en Couleurs” invite les artistes de l’Outaouais et d’ailleurs à se joindre à sa 8e édition les 6, 7 et 8 novembre 2015. Veuillez présenter votre demande avant le 15 avril 2015. Please find following the information about our guest speaker David W. Jones. Due to the large number of attendees at the AGM he ran out of copies. David offers a Summer Landscape Painting Course from June 16 to July 21, 2015 every Tuesday from 10:30am to 4:30pm. For further information please call Caroline Akeson (O.C.D. School Board) at 613 239-2309. 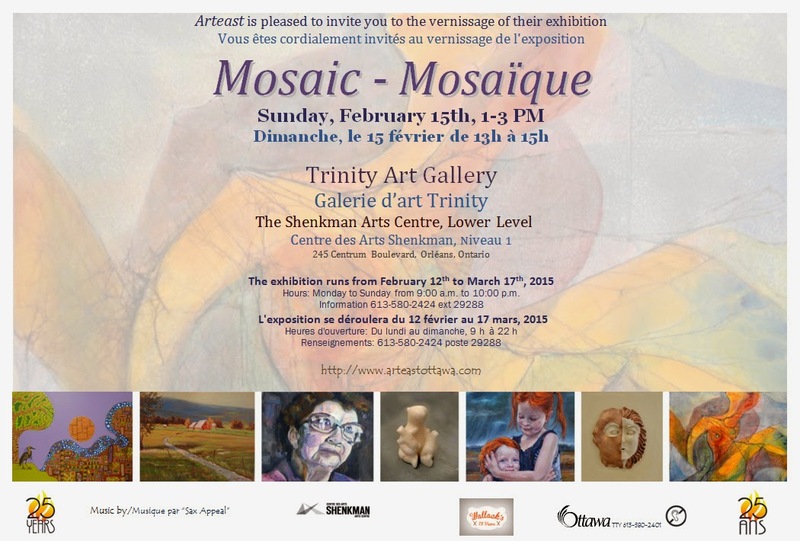 Carmen Dufault and Josie De Meo were asked about Arteast Ottawa’s 25th and Mosaic`s exhibition. We want to thank Rogers and Entre Nous host Barbara Laurenstin, for this opportunity to promote our organisation and our artists members. by ARLETTE FRANCIÈRE. This solo show is titled SKYSCAPE BLUES and runs from Jan 31 to Apr 4th. Arlette has always been attracted to landscape painting, although topography is not a main concern. Impelled by an inner compulsion, Arlette lets strong colours, bold shapes and rhythms guide her. In the process, her paintings become inner landscapes that express states of mind and emotion, instead of reproducing an external landscape. Skies feature prominently in her landscapes; she tries to capture the cosmic vastness through which our planet Earth spins us. For this exhibition, she has selected skies, whose rhythms and varied shades of blue evoke very distinct moods. Create a painting using the techniques of famous artists. Sun., 1-2:30 pm, Febr. 8, 2015 – Mar. 8, 2015, no class Febr. 15. For more information please contact her at (613) 316-1543 or go to her website at www.KerstinPeters.ca. ATTENTION MEMBERS: Please do not send registrations for exhibitions or other events to this email which is only used for information for the digest. The emails will not be checked on a daily basis. Therefore, please make sure that you send any announcements at least two weeks in advance so that they can be approved by the president in time. Thank you. Have a wonderful painting week. "A Painter's Life"/ "La vie d'un peintre"
David W. Jones est un peintre canadien du paysage. Depuis 35 ans, il participe à des expositions au Canada, Japon, Italie et États-Unis. On retrouve de ses oeuvres dans diverses collections : collection d'Art national sur la guerre, Ville d'Ottawa, Brian Mulroney, Département des pêcheries et océans, Benny Goodman un grand du jazz. Ami personnel de certaines légendes du jazz, Jones a créé des oeuvres utilisées dans la biographie d'Artie Shaw, CD et LP. Congratulations to Virginia Dupuis who has recently been accepted as a member of the Kanata Civic Art Gallery. She will be one of four new artists featured in the 2015 New Artists - “Fresh Faces” Exhibition from February 4th to February 28th. You are invited to the New Artists’ Reception Feb.7th from 1 to 3 p.m.
2500 Campeau Drive, Kanata, Ontario, Canada, K2K 2W3. Jessie Parker has a solo show titled “Journey” at Moksha Yoga Orleans, 2442 St Joseph Blvd. The show runs till mid April and is open most days all day. The public is welcome to visit. The show features 14 photo based works including 9 edition prints in pigmented dyes on canvas and paper, and 5 mixed media using photo elements and acrylics. All involve metaphorical journeys in her life. The interpretation will vary with the viewer’s own personal history. Kerstin Peters offers a new workshop series "Creativity & Me": During the first workshop, we will be creating a personal Valentine's Card for your sweetheart while enjoying some coffee/tea and goodies. To register or for more information please contact Kerstin at kpeters@DomingoInformatics.ca. Participation is limited to 12 people. There is a $10 fee. David Kearn is hosting a set of art workshops at the Rothwell United Church. He would be delighted to welcome some Arteasters. In 6 workshops, we cover key painting subjects and walk with some incredible Canadian painters. These workshops appeal to a wide range of skill levels: from relative beginners to practiced artists wanting to pursue a new style. Together we will dispel myths and develop sound practices, creativity and expression! Additional information is on the website: http://davidkearn.com/courses_e.htm.